Until now, the easiest way to convert lighting fixtures to an energy efficient solution has been to swap out old incandescent lamps for compact fluorescents (CFLs). With the rapid innovation of technology, LED lamps have surpassed CFLs in efficiency and performance features. Unlike most CFLs, LEDs provide light that looks, feels and dims like incandescent while still reducing energy costs by up to 85%. 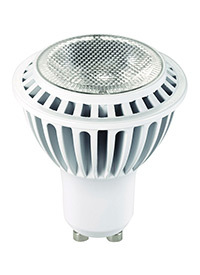 Couple that with a lamp life span of up to 15,000 hours and it’s easy to see why LEDs are invading homes. Sea Gull Lighting’s line of LED lamps match to 85% of our lighting fixtures, including recessed and enclosed luminaires, giving customers an easy and highly efficient way to “go green” with LED. 5W MR16, Frosted Bulb / GLass Lens.